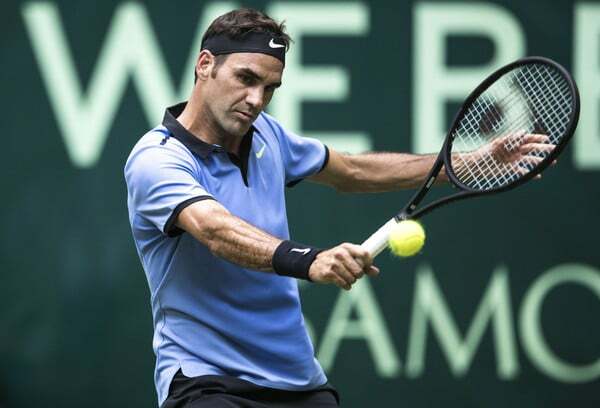 Match win 1,100 for the GOAT as he kicked off his Halle campaign with a comfortable victory over lucky loser Yuichi Sugita of Japan 6-3, 6-1 in 52 minutes. The Swiss looked in solid form against his short notice replacement after Yen-Hsun Lu withdrew earlier in the day. After the hiccup vs. Haas, it was the perfect start to the week against an opponent who had plenty grass matches under his best after winning Surbiton last weekend and playing in qualifying here. Federer won the toss and elected to serve. The first point was the longest rally of the match, and it showed Sugita wasn't going to die wondering as he went for his shots from the word go. But Roger soaked it up to hold to love for a 1-0 lead. Sugita quickly levelled for 1-1 with a hold to love of his own, but in game four he was broken to 15 and Roger breezed through the set taking it 6-3 with some nicely constructed points along the way. Into set 2 and the opening game saw Roger convert his third break point of the game to move in front and from there on he began to roll, breaking twice more for a five love lead for what looked to be an early evening bagel. However, the Swiss had other ideas, dropping serve from 40-0 love to allow Sugita on the board but it made little difference as the Japanese couldn't hold his serve as Fed sealed it 6-1. Good win here against a decent enough grass courter. Lu was the opponent on the original draw sheet but like I said in my preview post there were question marks over him after he withdrew from s-Hertogenbosch last week, so Sugita came in as the lucky loser. The two had never met before but Sugita can play some flashy stuff to reel off points, and after winning the Challenger in Surbiton he was unlucky to not qualify after losing a 3-hour match with Mikhail Youzhny. So heading in he was a tricky opponent given Roger's limited match play on grass so far but the Swiss did an excellent job of managing his service games and never really allowing Sugita into things. Winning the first point of the match was a nice settler too as the Japanese teed off on several groundstrokes and from there on it was plain sailing as the numbers suggest. Movement good, serve solid enough and he never really looked in trouble. Next up is Mischa Zverev who continued his good form from Stuttgart to see off qualifier Lukas Lacko in straight sets. Zverev should have made the final at the Tennis Club Weissenhof, and he's a tricky customer on this surface. He's got great volleys, a good serve and his forehand's hard to read. With that in mind, I think he'll put up far more resistance than the last time the two met in Halle which resulted in a double bagel. But I still think Fed comes through easily enough as I'm not sure where Zverev hurts him. So I'll pick Fed in 2 sets. What do you guys predict for the next round? Let me know in the comments. Routine win for Roger in just 52 minutes, looked solid throughout and by far the better player from the get go. First? Good Win This time. Finally a win ?. I hope that woube the start of a streak ? Elegance back on court! He seemed concentrated this time, wonderful winners. Probably continuing like that I think. Fed played nice. Great to see that fearhand AND STANHAND working so well! I like Roger’s business like mentality. Brushing off the opponents like it’s nothing and moving on. Next! ???? Good opener, hit a few solid rally balls and able to mix it up with serve/volley?, chip and charge etc. Braver on hittting the BH as well, much better than Stuttgart! Zverev I expect to be much tougher than last time but he may also be a tad weary so think Rog Shld come thru comfortably! Queens meanwhile in disarray losing top 3 seeds after Nadal and Delpo withdrew and Nick retired! Carnage! David Law must be in bits….. Didn’t expect Stan to win and when I saw Thompson name replace Bedene I did think Andy’s match got trickier! The FH was awol!! Fed needs one more win to secure top 4 seeding at Wimby! Fingers crossed for 4 more wins! ? Is that right, Susie? Does he just need one more win for number 4? Can you explain please? Yes As Jonathan says, down to the seeding formula based on last 2 yrs results which is why Novak will be pushed up to no2.,they only use it for the men. 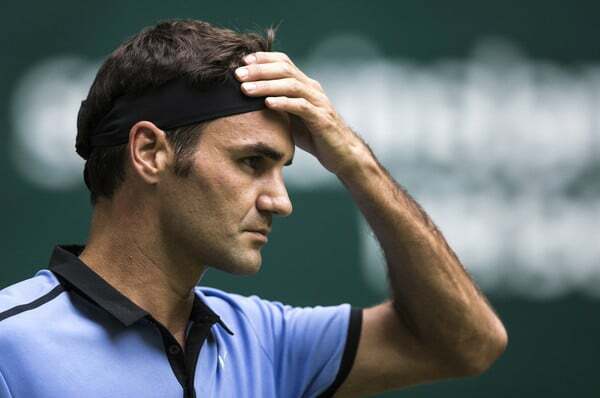 And if Rog wins title in Halle he will be no 3!! Wimbledon seeding different, based on grass results over 2 years. Stan losing first round big help. We want him seeded 17th RIGHT???? What is wrong with you people??!!! 2,3,4,5 = Novak or Rafa win. Haha, Alb – Many things are upside down this year – maybe also some of the usual habits. Good focus, moving well. As you say, good that his opponent didn’t just roll over for him – some amazing gets where Roger had to keep staying in the point & hitting one more shot. The brain freeze in the 5-0 game in set 2 was bizarre, but good to see him regroup immediately & not wait for his next service game to close it out. Great start, & hopefully a great start mentally as well. Still don’t get the ridiculous half-length vertical stripe down the back of the shirt. Didn’t want to be cruel to his opponent who filled in at the last minute so gave him a game. Wow the top 3 seeds at Queens are already gone in their first match. Federer losing to Haas doesn’t seem as worrying now. Kokk played Rosmalen, lost to Youzhny. Good start at Halle, minor blip when serving the match but its manageable. Can’t afford to let that slip when against Mischa. It will be a more competitive match, Roger has to stay focus. We do all this prognosticating (which I will now call Fed-nosticating – cause we need our own nomenclature over here). But take a look at Fed’s results this year and ask yourself: how much can be ascertained about the future from the past? He stays away from all tennis 6 months and on his first tourney back he wins a slam he hasn’t won in 10 years. Five 3 setters in 4 matches and then down a break in the 5th against the Bull. 2017 Fed loses to guys he should never lose to in ridiculous fashion, and then he beats everyone he should lose to in a variety of beautiful ways (Eg. IW: CRUSHES Rafa to tiny bits like never before, Miami: hangs on against match points w Berdy and Nick). He chokes at the 300th ranked Donkeys of the ATP and plays “2007-flavor” clutch against everyone else. All this is after years 2014, 2015, 2016… playing so well and ranked so high so consistently – and lots of Fed-nosticating – that led to no major wins and TONS of heartbreak. So, I say, if 17th seed gets him his 18th major after a five year drought then I want 17th seed at Wimby. No thanks to a top 4 draw. Maybe Fed needs Berdy and Kei and Murray and Stan before the final? But seriously – it’s all just guess work right? It’s fun, but if the last 6 months have taught us anything, it’s that nothing can be predicted – except that Fed can’t be predicted. Um…he won in 2010 so that’s only 7 years. oops. My bad! Right you are Sid! Score closer than I predicted. Zverev was quite good and pressed a lot in 1. 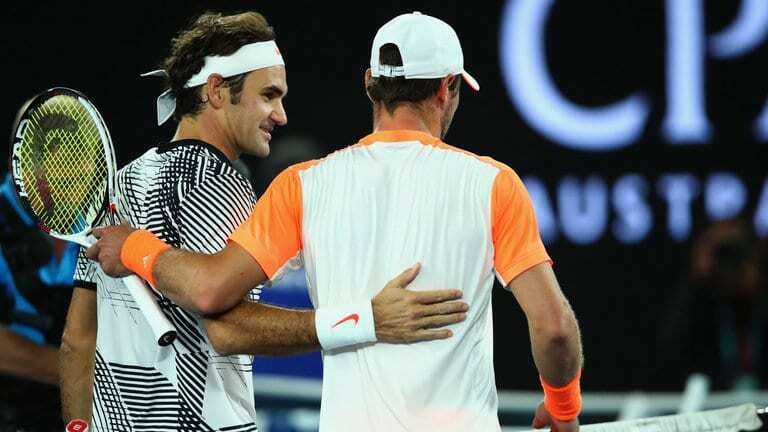 In second Fed upped and the performance from both became wonderful – both pressing each to do some vintage games! Look forward to watch this set again in replay! Yes I saw the match live. Was a nice duel to watch for the eyes because it was different.